Albanian rituals performed at burials thousands of years ago differ from the customs of today. Learn how 12th century grave mounds or grave circles were created and decorated as well as what kind of items were buried with the deceased. Albania, or officially known as the Republic of Albania, is a European nation that is west of Greece and borders the Adriatic Sea. Albania has been populated since prehistoric times and was settled by the Illyrians. Due to its location, the country has suffered numerous violent battles. Ottomans, Greeks, Romans, Byzantines and Venetians left their markings on this small land. The major religions of Albania are Sunni and Bektashi Muslim, which make up 70 percent of the population, Albanian Orthodox at 20 percent, and Roman Catholicism at 10 percent. After World War II, Albania became a socialist country, claiming it was anti-religious. In 1966 with communism, Albania made it known that she was the world's first country without a God. She felt that by denying religion she could put to rest her feudalistic history. At that time, all the churches were taken over by the government and the priests were forced to stop practicing. The fundamental Islamic rituals ceased, including the banning of eating pork. Albania's borders were closed, and no foreigners were allowed into the nation. Recently, they have been opened and tourism is on the rise. With the fall of communism in 1991, Albania had its first democratic election in 1992. Archeologists have done significant study on the findings of ancient Albanian burial practices. In 1876, German archaeologist Heinrich Schliemann discovered these ancient tombs. Grave Circles or Grave Mounds - Dated 1650-1400 BCE, these were pits dug into rock. These were the first circles. On their floors, small stones were placed. Then the corpse was put on top of the stones. Timbers, clay, and slabs of material were created to form walls and then dirt was poured to fill the rest of the rectangular shaft. In addition to the bodies, jewelry, hair pins, bronze weapons and other possessions were also buried in these graves. The outside walls, forming a second circle, were elaborate with etched designs. Tholoi or Beehive Chambers - These were sunk into the edge of a mountain with a long passage lined with large stones. The stones were arranged precisely to look like a beehive formation. There was a doorway with a small door leading to a side chamber. The doors were often overlaid with metals. An open triangle was built over the doorway. Often in this ancient culture, triangles pointing upward were a sign of the Holy Trinity and could have been an indication of a spiritual site. Usually these rituals are performed largely by females. It is rare for men to follow in these behaviors. At times, professional female mourners are hired. These rituals most likely came from the Jewish or Greek Orthodox traditions since at Muslim funerals, excessive crying and a loud demonstration of emotions is forbidden. The traditional folk Albanian polyphonic music is sometimes played at funerals as well as at weddings in the northern and southern regions of the country. This iso-polyphony is performed usually by men. 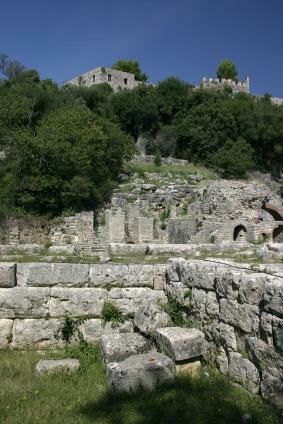 The ancient burial ruins are now historical sites, increasing the tourist population in Albania. Tourists can marvel at the skilled craftsmanship of the structures as they learn about ancient civilizations that has contributed to the landscape of Albania today.